Horses killed more people in Australia in recent years than all venomous animals combined, research has shown. The University of Melbourne's Dr Ronelle Welton examined hospital admissions data and coronial records. From 2000 to 2013, horses were responsible for 74 deaths. Bees and other stinging insects were the next most dangerous, causing 27 deaths, followed by snakes, which also claimed 27 lives but landed fewer people in hospital. Spiders were not responsible for any deaths during that time, the research showed. Dr Welton said the study, published in Internal Medicine Journal, challenged stereotypes around Australia's venomous animals. The main focus of her study was animals that bite and sting, but she uncovered the number of horse-related deaths in the process. 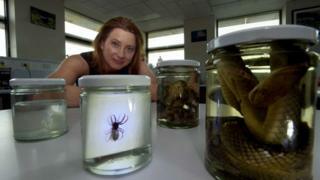 "Australia is known as the epicentre of all things venomous," Dr Welton told the BBC. But "what was surprising" was that insects caused the most people to seek treatment in hospital, she said. Dr Welton said the research showed allergic reactions to bites or stings posed the most danger.